In a nutshell, The Story of Mankind has humanity on trial for its’ very existence. The Devil himself (played delightfully by Vincent Price) is the prosecutor. The Spirit of Mankind (Ronald Colman) is the advocate, and Cedric Hardwicke as the Celestial Judge. Evidence is presented as a series of vignettes of various stars presenting famous historical moments. Some moments are serious, and others more silly. The Marx Brothers appear in their final film, although they never show up together. Each brother has their own distinct scene. The scenes with Vincent Price are simply delightful to watch. It’s hard to imagine someone else playing the role of the Devil any better. The Marx Brothers are also good in their scenes as well. But there’s a lot of stock footage, with some of the scenes being frankly boring. There’s a reason it was included in the book, The Fifty Worst Films of All Time. Here is the most far-out courtroom thriller you’ll ever see. The setting is outer space, the defendant is all of us and the issue is whether we should be allowed to survive. Defending counsel, the Spirit of Man (Ronald Colman), says yes. Prosecuting counsel, the Devil (Vincent Price), says no. 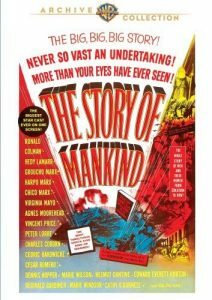 And each presents historical evidence in vignettes that feature Hedy Lamarr as Joan of Arc, Dennis Hopper as Napoleon, Harpo Marx as Isaac Newton, plus Groucho, Chico, Virginia Mayo, Peter Lorre, Charles Coburn, Agnes Moorehead – 25 stars in all! Produced, directed and co-written by Irwin Allen (The Poseidon Adventure), this uncommon curio is Colman’s final film and the last time the three Marx Brothers appeared in the same movie.